1. Does the company have the products or services with sufficient market potential to make possible a sizable increase in sales for at least several years? 12. Does the company have a short range or long range outlook in regards to profits? 13. In the foreseeable future, will the growth of the company require sufficient equity financing so that the larger number of shares then outstanding will largely cancel the existing stockholders’ benefit from this anticipated growth? comes in handy. It acts as a guide to your investment research. The following is my scuttlebutt for AeroGrow. You may also read my first valuation report on AeroGrow. is the first user friendly, fool proof, kitchen top appliance out in the market. There is a significant market potential for the product and demand can be seen by growth in sales and distribution. If the product was not appealing or didn’t have the market potential, distributors such as Macy’s, Target, William Sonoma, Sears, JC Penney, Bed Bath Beyond, Amazon and many more would not want to waste valuable shelf space for such a product. The sales may not be maintained for 10-20 years, but an increase for at least “several years” is highly probable. Management clearly has determination. Just go to their investors website and read their reports and listen to the conference calls. From the very beginning, the AeroGarden wasn’t created for the sole purpose of being a kitchen appliance. The company and management created the AeroGarden so that a recurring revenue stream occurs with it. With each sale of an AeroGarden, the consumer must also use the company’s proprietary seed pod kit or the deluxe kit for those that want to germinate their own seeds. Accessories such as hood extensions, pumps and even halogen light bulbs have a proprietary connector to spur additional revenue growth. Although the AeroGarden is the main product of the company, differentiations of the AeroGarden are being sold that aims at different demographics to reach a broader market and to increase sales potential. Such products include a variety of windowsill/tabletop/wall attached pods priced from $29 to $99 expected to launch in 2009. From the information below (click for larger version), R&D expenses have been pretty consistent. Percentage wise, the values aren’t as consistent but that is due to the size of the company. The increased revenue in 2007 with the same R&D expense gives a low ratio, but in relation to the company size, I don’t believe they are overspending. We will have to wait for more quarterly figures to see whether AeroGrow is investing in R&D for future products to drive growth. If R&D expenses dry up after the AeroGarden, it could be a warning sign that the company isn’t looking out for the future. As I previously mentioned in the other post, AeroGrow’s distribution strategy and reach is excellent. Their sales occur through retail, electronic (web, telemarketing), print (numerous catalogs) and internationally. It’s interesting to note that many people have bought more than one AeroGarden. This person has five. The current gross margin for the quarter came out to be 38.9%. That is a very respectable margin which should leave plenty of profits for both the distributors and AeroGrow. Compared to companies like Jarden or Whirlpool with gross margins of 27% and 18% respectively, AeroGrow has a very profitable margin. Basically, as much as the past profit margins are good, the future margins are the most important to the investor. There are many things that can reduce the profit margin. Competitors, rising prices in commodities, energy and food are the noteworthy. Thankfully, I don’t believe any of these would greatly affect the margins for AeroGrow. Being the first to market, AeroGrow has kept the AeroGarden at a reasonable price, but the seed kits and accessories provide a huge margin. As AeroGrow grows and creates an economy of scale, margins should be increased by maximizing capacity and efficiency. With the company being so young and not enough media attention or information, it is difficult to say whether the employees are being treated fairly by their employer but we do know that AeroGrow provides medical, dental, vision and 401k benefits to its employees. Since the company is still at the beginning stages of its venture, executives should have confidence in their CEO and chairman. This means that from the lowest levels up there is a feeling that promotion is based on ability. There is no ruling family in this company where the son/daughter is promoted over people. Salary adjustments should be reviewed regularly (at least yearly) and in line with industry and local standards. The DEF14 filing should provide all this, but AeroGrow does not have any available at this point in time. Go to AeroGrow’s website and visit the management/governance section. It seems like AeroGrow has a diverse management team tackling all necessary business aspects. One thing I like especially like is that the founder does not try to control everything. Michael Bissonnette gave up his role as CEO so that he could concentrate on what he could do to help the company and not on how he should run the company. It shows that Mr Bissonnette trusts his management team and also delegates his authority to each individual. Real delegation of authority empowers management to utilize their individual given talents to produce results. There is both good and bad to this section. The good. AeroGrow only registers sales into its books once a product has been shipped unlike many companies that count sales as products that have been ordered. The bad. AeroGrow needs to get a better handle on their expense and operation costs. They need to watch their cash stash and be able to convert profits into free cash. Being the size that it is, AeroGrow must focus on the short term to generate profits and cash to continue running its business as well as a long range outlook. A method of long range outlook is the seed kit business model as well as researching additional seed kits, products and expanding into international countries. With the current growth and demand, AeroGrow definitely has the ability to provide growth and returns from its cash and financing. Listening to the conference calls reveals that the chairman and CEO are both open and honest about what is happening within the company. They are candid in explaining their difficulties. I just read this humorous discussion on Yahoo about management which you will definitely find useful. This is yet to be proven. One thing to note is that Philip Fisher was a pure growth stock investor and running through the checklist for AeroGrow seems to confirm this. Of the 15 points, there aren’t too many negatives but since most of the points are related to growth, this is to be expected. It seems like AeroGrow scores 11/15 where 3 of the points is neutral. Looking back at the 15 points, AeroGrow has the potential for huge gains in both the market and stock price. However, keeping an eye on management’s integrity and how they handle different business scenarios for good and bad times will be interesting as the company continues it growth. Incredible article! Every one can get a lot out of it! Thanks for stopping by. Appreciate the comment. Thoughts from the latest quarterly report. 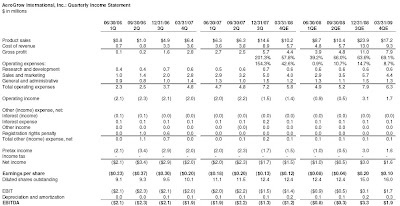 First profitable quarter but at an incredibly desperate manner Their accounts receivables, inventory, debt and cash outflow increased too dramatically. They are trying to grow at any expense without regard to actual business economics. Product may be great, but my predicted risk of management happened to be true. Getting out now at a 50% loss. brilliant blog, found it by a mistake….very valuble comments.